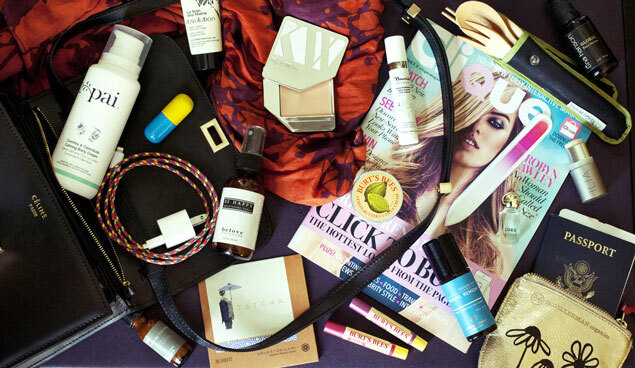 Last month when i was in London, the very cool girls from the UK’s well-known site: What’s In My Handbag paid me a visit in my hotel room. They arrived just as I was thumbing through the latest issue of the UK’s Clique magazine, featuring the beautiful US model (and amazing cook, and plus-size swimsuit line designer) Robyn Lawley in their cover story. I love working with Robyn and seeing her beautiful mug on the cover was such a nice treat. I was in the UK to help Burt’s Bees launch their beautiful line of color lip products in Europe and had such a wonderful time meeting countless editors, beauty bloggers, makeup artists, and Burt’s Bees distributors from numerous countries. I loved doing lip makeovers (I think I did nearly 80 in one day! ), and introducing everyone to my favorite layering techniques. It turns out that the shop keeper was actually the owner of this, the first ever green beauty store in London! The lovely Imelda then showed me around the shop, introduced me to locally made, and sold-in-the-UK-only products, and then the amazing entrepreneur even walked me to the first ever organic juice shop that had just opened up nearby. In the photo above, you’ll see the hand cream, eye cream, and pretty glass nail file that I picked up while in her beautiful boutique (that not only sells the best products, but also offers beautifying and relaxing services in the little treatment rooms in the back). I love knowing what treasures other women are toting around in their hand bags and toiletry kits, so i felt it only fitting to share what I had in mine. Click here to see the full piece on the whatsinmyhandbag.com site.